Walk into any golf store and you'll see hundreds of clubs that are all essentially the same. From Nike to Callaway to Titleist to all of those cheap brands you've never bothered to try, there isn't a whole lot of innovation across the board from leading golf brands. And it's not their fault. People have been slapping little white balls with sticks for hundreds of years; most of the good ideas have already been though up. TaylorMade's R7 Woods look to step out from your everyday set of woods by introducing an innovative new feature: adjustable weights in the club head. The idea is that by switching the position of two small weights (one weighing it at 14 grams, the other at 2), you can more easily shape your shots the way you want to. This Moveable Weight Technology (MWT) is said by TaylorMade to shape your shots up to 15 yards either way when used properly. The club head itself is made of lightweight, high strength steel composition that makes the MWT work so well without giving the R7 an abnormally heavy feel to it. It also features TaylorMade's RE-AX Graphite Shafts, which are designed to increase consistency, control, and distance, although these can of course be replaced by whatever shaft you feel comfortable with. 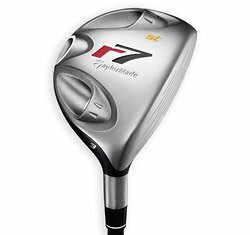 The TaylorMade R7 Fairway Wood is a great example of a successful golf innovation. Suddenly shaping your drives, a feat considered very advanced by most golfers, has become just a little bit easier.